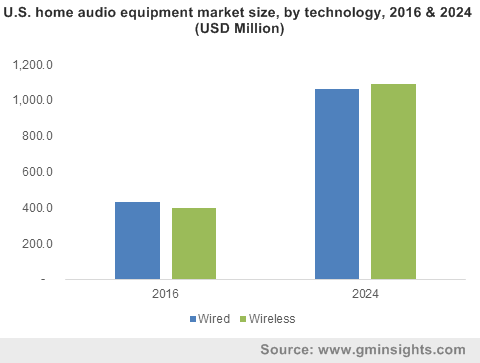 Home Audio Equipment Market « Global Market Insights, Inc. The robust proliferation of smart devices and the evolution of home entertainment systems have led to home equipment market charting a profitable growth path in recent years. Lately, in-house entertainment systems have been witnessing a massive demand, and with the emergence of IoT, Bluetooth and Wi-Fi, the integration of home entertainment equipment with common operating devices like smartphones has indeed depicted a rise, fueling home audio equipment market trends. With the widespread penetration of internet, the home audio equipment industry has evolved to manufacture products that are compatible with all media types available on the internet and can directly stream online content. The expansion of e-commerce has also exponentially increased the availability and affordability of these devices, that has further helped expand the scope of home audio equipment market. Home entertainment has now reached an all-time high with the growing millennial population, the demands of which have revolutionized the home audio equipment market trends. As the requirement for high definition music systems has increased exponentially in the last decade and consumers have been experiencing the pleasure of increasing disposable incomes, the growth of the home audio equipment market has been on a remarkable increase. Products that are highly priced with explicit sound quality and those that are low priced and easily affordable, have both been gaining traction in home audio equipment market, in major geographies. Consumers in North America and Europe for instance, have been driving the high-priced home audio equipment market with their demand of high quality audio. Bearing evidence to this fact is the popularity of the Airhome concept that is integrated in the building itself. Builders nowadays, are offering to sell homes with the wireless audio system already installed, a phenomenon that can revolutionize the home audio equipment industry. The landscape of home audio equipment market has also experienced a revolution with the emergence of the smart speaker. In fact, as is observed, home audio equipment industry is being inundated with devices like Amazon Echo, Sonos One, Google Home, JBL Link and others that can be commanded by the user to play music from the smartphone or cloud. These speakers can also read out a book, check the weather or play the news – a remarkable upgrade from speakers that could only play music from the playlist. The compatibility of audio devices with other smart home devices also determines the salability of the audio device. For instance, audio speakers and sound bars that are compatible with smart TVs with 4K technology are driving the home audio equipment industry growth, as technologically advanced televisions are becoming more popular and affordable and deliver a better overall experience when paired with a good audio system. Home audio equipment market is indeed observing a major impetus, on account of the growing number of consumers who have large music libraries and demand high definition music players that can access music from online music libraries such as Google Play Music, Amazon Music, Spotify and style Jukebox. Major geographies have been capturing a substantial share of home audio equipment market, with key companies manufacturing an affordable range of products. Renowned home audio equipment industry giants like Bose Corporation, Philips, Yamaha, LG Electronics, Sonodyne, Bowers and Wilkins have indeed taken note of the major growth prospects of this business space and are seemingly ramping up their investments in high-grade technology. This in consequence, would majorly impact home audio equipment market size, estimated to register a valuation of USD 20 billion by 2024. This entry was posted in Electronics and Media and tagged Audio Equipment Market Size, Global Home Audio Equipment Market, Home Audio Equipment Market, Home Audio Equipment Market Size, Home Audio Market, Home Radio, Home Theater in-a-box, Home Theater Market Size, HTIB, Receiver, Soundbar, Speaker, Wired, Wireless.